The best drones for beginners are designed to offer complete control over their launch, flight, landing, and on-air functionalities. They are economical in pricing and help multiple applications like photography, videography, surveillance, and entertainment, etc. Quad-copter is the most recommended form of done for the beginner. It is because they provide stability and security better than the other models. They are powered by four propellers and motors. They offer effortless control over their space position and movement. You will find it easy to pilot the device within the interiors and exteriors of your home. They don’t break or get damaged after multiple crashes. Here you can read about four of the best drones for beginners. 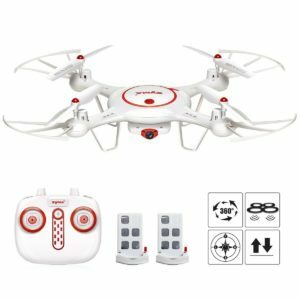 The Syma X5UC 2.4G RC Quadcopter with HD Camera is done for beginners, with a four-channel remote control, HD camera, flashing lights, four propellers & motors, lightweight aircraft, and inbuilt memory card and card reader. It comes with a foot stand and protective gear to ensure safe landing and crash protection for the sensitive parts. The twin main motors are installed on safety mounts to work in clockwise and anticlockwise directions. The dimension of the Syma X5UC 2.4G is 32cm X 32cm X 7cm. The net item weight is 0.16 ounces. You can fly the Syma X5UC 2.4G up to 70 meters of controlling distance with the remote. The done HD Wi-Fi camera has a capacity of the 2Mega pixel. You can shoot high-quality stills and videos. The resolution, frame rate, focal length, focus distance, and the type are fine-tuned to match the basic level functionalities and quality. The installation of the 4GB SD card ensures you can store plenty of high-resolution videos and images. The 6-Axis Gyro offers complete controlling of the Syma X5UC 2.4G with the help of 2.4G remote. You can make the aircraft fly, hover, and safely return home. The onboard flight controller is designed to receive the signals from the remote seamlessly to stabilize the flight under varying heights. The controller and the sensors can detect the slightest signals from the remote for forwarding/reverse flight, lift and drop, 360-degree rotation, etc. Speed control allows you to fly the Syma X5UC 2.4G in low, moderate and high speeds. You can control the flight orientation and angle of rotation smoothly with the help of the remote. You can also perform flipping actions, once you can perform the basic operations efficiently. The maximum flight duration of the Syma X5UC 2.4G is 7 minutes on recharge. In the beginning, you may find it difficult to cover optimum distance within this time. As you master the controls, you can enhance flight performance. The 4G drone remote control has twin function levers (left and right), power on/off, takeoff/landing, photography, videography, and the 360-degree flip control. The remote is powered by 4XAA rechargeable batteries. Learning to use the remote is one of the easiest tasks you can perform. In fact, you can master the controls within a few hours of consistent practice. The Li-ion battery of 3.7V-500mAH capacity is highly efficient in running the drone for 7 minutes without stopping. The recharging time is about an hour and 10 minutes. Make sure you charge the battery fully and avoid frequent battery draining. The Syma X5UC 2.4G is sufficient if you wish to use it as a hobby device. You can also learn the basic techniques of controlling the flight, the flip, hover, camera, and the Gyro. 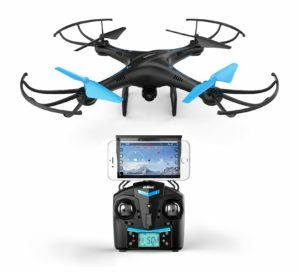 The U45W Blue Jay drone is an absolute delight for the beginner, as you can control it with the remote and a smartphone (I-Phone/Android). You can customize the familiar flying route with the initial settings. Then the drone can automatically fly in this path every time. The 6 axis flight control can allow you the freedom to fly the drone to a distance of 97+ meters with no hassles. The 720P HD camera with live video feed is perhaps the best part of a beginners’ drone. Controlled by the Wi-Fi port, the camera captures vividly colorful footages from varying heights. You can store the recorded videos in the 4GB SD-card mounted onboard. The first person view of the camera. It uses high-quality imaging sensor for high resolution, true color capture, and near-zero distortions during live video shooting. The camera offers a good range with optimum exposure value. The focal length and width balancing results in an optimum field of view. You can also use the camera to capture HD still photographs. It is made possible by freezing the video and taking the snapshot. The camera has an inbuilt ability for 360-degrees view. The synchronization of the footages is made simple in this mode. The capturing of the space and the surroundings happens in real time. You can see the frame-wise captured image you record the footage. The U45W Blue Jay gives you the thrill of having absolute control over taking off, flight, hovering, 360-degree flip, and the headless mode. You can pilot the drone in a direction that is relative to you. This motion is independent of the direction in which the drone head is pointing. This feature gives you precision control over the flight. Using the altitude hold mechanism, you can let the drone fly at a specific height without having to control it through the remote. The other benefit is you can manually control the factors of pitch and roll according to your needs. The custom route mode can be set up with the help of the mobile app. You can open the app and trace the path according to your specific need. Then you can feed the path to the intelligent system built into the U45W Blue Jay. Now the drone can travel along this path without any external control. The twin batteries of the U45W Blue Jay can prolong the flight time into the 2X mode. That means it is twice the standard time offered by the standard drone for beginners. You can afford to have extra flight time for flying that extra distance without having to recall the drone for battery recharging. The 2.4GHZ remote control has a display unit with twin functional levers. You can control the forward flight, 36-degrees rotation, flip, and the ascending & descending action. Once you have set the vertical height to a value, the drone comes to an easy cruise mode at the same altitude. You can also make the U45W Blue Jay hover at this height. The U45W Blue Jay comes with a custom app that can be installed on a smartphone (android and IOS). The menu and screen buttons you see on the app let you control the drone in a better way. You can use the app to view the live video feed from the U45W Blue Jay and also record it o your smartphone. The app can be used to edit the raw footage into any of the formats like the MP4, MOV, and AVI, etc. You can also edit the raw footage using any of the software apps on your phone. The twin battery system has a better storage capacity that lasts twice the time of the single battery system. With faster recharging time, you can have extended flights. I would personally recommend the U45W Blue Jay if you wish to become a professional videographer. The basic controls are simple and easy. The only issue comes, when you wish to shoot by hovering over a spot for a long time. It could extract the battery energy and force you to recall the drone back home fast. However, this should not prevent you from gaining the valuable experience of working with the live video feed camera. It is better to use the smartphone app to work with the drone, rather than depending on the remote. You can get better options. The DBPOWER X400W is perhaps the most economical drone with live video streaming and connectivity to the 3D virtual reality headset. The Wi-Fi-HD camera captures the First person view footages and transmits them in real time. The depth of field, coverage and the quality of shooting give you crystal clear videos for viewing and recording. The other notable features are the headless mode, single button return-home, 360-degree roll and flip, twin speed mode, and a sturdy body made of high-quality ABS engineering plastic. The Wi-Fi HD camera has the FPV feature with connectivity to the 3D virtual reality headset. The combination helps to increase the depth of video footages to considerable levels. All you have to do is interface the headset and the drone camera through the smartphone app. Once you have configured the connectivity it is possible to view, edit and record the live feeds using the best editing apps on your phone. This process requires some practice and patience. But you can master the art within a few days. The MJX-H app from the parent company is designed for maximum performance to generate FPV effects. The smartphone control over the camera also makes it possible to view and record incredible footages, when the drone takes 36-degrees flip and roll. You can record the videos on the high capacity TF card in multiple formats. Moreover, the video has hi-fi audio recording, which makes your videos truly HD in quality. The speed mode for beginners helps you in learning the basics of piloting the drone. You can safely fly and hover, flip, roll and return home in this mode. Once you have mastered these controls, it is possible to change over to the expert mode. Here, the speed of the drone increases considerably. Yet, you can control the maneuverability, flight, altitude variation, and other piloting options efficiently. The headless mode lets you fly the drone on your desired path, regardless of the head pointing direction. This feature is highly useful to you as a beginner, since you may not be too familiar with changing the orientation of the drone frequently and faster. The Gyro and flight control circuits onboard the drone is synchronized perfectly with the remote sensors. It helps in aligning the propeller actions with the motion direction to balance the drone’s body. The center of gravity shifts when you set the DBPOWER MJX into flip and roll. However, the system manages to align it to the safety points and avoid wild crashes. Even in cases of emergency, you can use the single home-key to make the drone return safely. The 2.4G transmitter has the twin function levers for complete flight and direction controls. Switching the direction through 360-Degrees is made simple with the help of additional buttons. The control range of the DBPOWER MJX is up to 100 meters. The DBPOWER MJX is controlled by an OEM software app named MJX-H. It is compatible with most of the Android, iPhone and other smart devices. Lithium-Ion battery provides extended flight time with support for the HD camera and the TF card recording process. Since the flight range of 100 meters, the power of the battery is relatively stronger compared to the other models. Works in Beginner and Expert mode. It is good enough for the intermediate level users also. My personal recommendation for the beginners is to utilize the live video streaming and the 3D-Vr compatibility, for learning professional aerial video shooting skills. You may need an extra time of practice to gain that professional touch, but it will surely happen. Make sure you have additional rechargeable batteries in stock when you go out. You can save the time of recharging a single battery for exploring the video shooting possibilities. The consistent progress in drone technology has brought the hi-end features of the expensive devices within the range of economical systems for beginners. 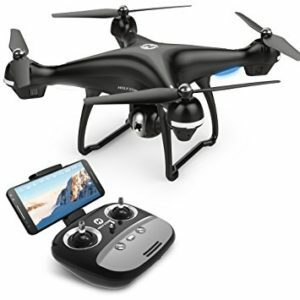 The Holy Stone GPS FPV RC Drone is the perfect example, with long-range distance, extended flight time, live video, Wi-Fi control, 720P HD quality, altitude hold and plenty of other features. The cost of the drone is relatively higher compared to the other drones for beginners. But when you compare the functional features of the drone with the high-end systems, it is an offer you simply can’t refuse. The 720P HD camera has the top resolution, frame rate and speed, focal length, focus distance and depth, ISO, video and image sharpness, and other high-end features. You can shoot the videos, while the drone is on the move. You can capture incredibly beautiful snapshots when the drone is put into cruising mode with the altitude setting function. You can also put the drone under hover mode and capture stunning footages from comfortable altitudes. The wide angle feature increases the field of view, while the bird’s eye view increases the depth of field. The camera can rotate through a 90-degree angle to cover maximum footage for the shooting. You can use the drone for wildlife video, industrial and commercial security surveillance, sports coverage, event shooting, etc. You can record the videos in the 8GB TF card onboard. The Holy Stone GPS FPV RC Drone remote control has the display options to show the live video streaming from the camera. The GPS system allows you to get accurate details of the geographical positioning with satellite connectivity. The additional features are 15 minutes of flight time with a range of 150 meters. Inbuilt return to home enables safe home landing in cases of emergency situations. An additional control feature is Follow-me. When the setting is made, it follows you wherever you go. The Holy Stone GPS FPV RC Drone Li-ion battery 2500-mAH-7,4V (for the Drone) runs for 15 long minutes without break. The remote has a 300mAH-3.7V LIPO battery. The 2.4GHZ remote control has a signal range of 500m, which can also extend the control range of drone under standard conditions. The Holy Stone GPS FPV RC Drone features make it look like a professional class device. But the manufacturer /retailer statement that is best for beginners surprises you. I would personally recommend it if you have taken a decision to opt for a profession in industrial security, wildlife shooting, sports coverage or any other similar projects. You can get the best first experience of high-end technology. As a novice, you should not buy a drone because you see one. There are certain things you must consider to make a good choice. Know that the first drone should fly from the box. Here are some factors to consider making a choice. It is advisable that you consider the RFT quadcopter when you are making your first choice. This is simpler to use because it simply involves charging, put on and then fly with it. Because you are a beginner, it is not advisable that you use the BNF versions. The most interesting thing is to get a drone that can enable you to fly slowly and then steady. You can start at a low speed until you graduate to a higher speed. When you are flying for the first time, you have to charge your drone battery. The most important thing here is that you look for a drone model you will not find hard to use and to control. Other than that, you must consider other important factors so that you can make a perfect choice. For the beginner, the dimensions of the drone matter a lot. You can often begin with a smaller size. Use lighter models because it will be relatively easier for you to control than to use a larger model, which might pose some difficulties as a beginner. Choose those you can contain the palms of your hands. There are different models out there. You have to read reviews about the various models and choose those that are easier to fly. Consider the weight while you are making your choice. Choose those that do not weigh more than fifty grams. This will be easier to control and it can be more stable when it is in the air. Those models that are too hard to fly are not the best for beginners. Moreover, such models are designed for advanced users, as they are not affordable. Because of that, it is advisable to start with a quad, which you can easily use and stop when you want. It is advisable to start with easier models before advancing to the more difficult models in the market. Another important feature to consider when you are making your choice includes spare parts availability. It is possible that the drone can be clashing from time to time. As a practice tool, it needs to be replaced when it crashed. Get a product which parts are readily available. Apart from the fact that the parts are readily available, but these facts must be readily available and they must be affordable as well. When you are making your choice, you must also consider the issue of location. You must have enough space where you can fly your drones and not everywhere, you see. There are chances that it may fail within a few seconds of taking off and it can fail. When it fails, it should be in a place where you can easily locate the drones. Because of that, you must have enough space in the outdoor. While thinking about location, you must consider the issue of wind. Certain models can be taken by the wind and you have to consider that issue when you are making your choice. Moreover, you must consider the flight time when you are making your choice. When you choose the flight time to ensure that you have fully charged battery as well as spare battery you can use to back it up. As a beginner, you have to sure that you get the best flying experience and you must get the best product that can guarantee stability. Battery is equally an important issue when you are making your choice. There are two things to consider when you are making your choice. The first thing to look out for is when will the battery becomes fully charged. Do not go for those that can take almost one day to become fully charged. Instead, look for those that can charge within a reasonable time. The second aspect to consider about battery is longevity. If the battery is fully charged, how long are you going to use it before it runs down? You must consider these two factors about drone’s battery when you are making your choice. Because of that, it is recommended that you come with a spare battery so that the drones can last longer for a considerable time. Furthermore, consider the issue of cost when you are making a choice. 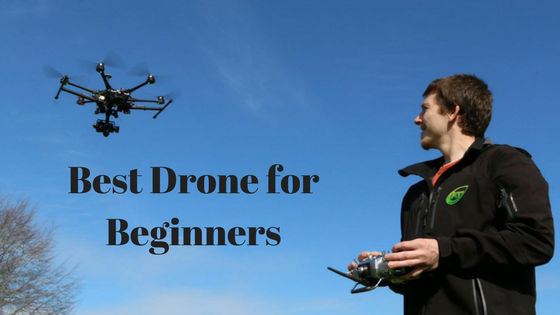 As a beginner, it is not necessary that you begin with the most expensive drones. It is possible that you lose them easily because you can bash it. When you bash it, you will spend a lot of money to replace the damaged part. It is easier to start with the most affordable because it will be easier to maintain. Furthermore, you must put in the issue of personal preferences. Even though you should not go for the most expensive, you should buy a drone you should be proud of when you buy one. It is important that you consider your personal preferences when you are making a choice. It is not necessary to go for a product you will not regret later. When you are looking for a drone as a beginner, one of the things you have to consider include the issue of accessories. One of the important issues when it comes to accessories is the camera. The camera is important because you can use it to take pictures of images. If you are looking for a drone for photography then the most important thing to consider is the issue of camera. Look for a quality camera that can give you the kind of images you like. Therefore while making your choice; you must consider the issue of camera. Look for a quality camera that can serve your purpose very well. Think of the type of photography you want to take. If you want to take videography as well as aerial photography. There are certain things that you should expect from a camera such as a shutter speed, ISO as well as the size of video that you want to make. In achieving all these, the camera matters a lot here. Take your time to consider the kind of camera that can serve your purpose very well. Furthermore, consider the range the drone can go because it helps in determining the control. You have to take your time and consider the range the aircraft can go. You should not rush to the market to make a choice without first carry out a feasibility study. Before you go to the market, first determine what you want to achieve with the drone. When you determine what you want to achieve you must focus your attention towards achieving that plan. Flight ranges matters for beginners. It can start from 50to 100 meters. This is ideal for beginners. For advanced users, they can opt for 5000 meters. Something was said about the cost. 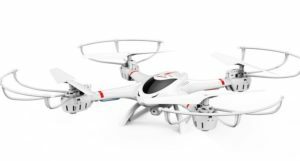 When you are looking for a drone as a beginner, you have to consider the features. It is better to use affordable drones but then thinks of the features available in such a drone. One of the things to consider when you talk about features includes cameras. If you choose cheap drones, they do not have cameras and this means that you may find it hard for you to take photographs and videography and so on. Something was also about weight. Remember that if your drone is weighing more than .55 pounds that you have to register it with the FAA. To avoid running into trouble with the authority, you must not go for a weight that might go contrary to the law. Beginners should look for the least weight before they advanced to more weight. As a beginner, you are still a learner. Furthermore, talking of location. Remember that it is not advisable that you go out of the line of sight. You should fly within a range the drone will be observed on the air. Ensure that fly within a range, you can see all the obstacles and avoid those obstacles so that they do not damage your drones. To ensure that you are never disappointed, you should always fly with an extra battery. Such an extra battery should be fully charged. You have to fly within reach so that you take your time and fly. Something was said about spare parts. Some of the spare parts that you must always look out for when you are making a purchase include the propellers. For beginner fliers, you are certain that the drone would crash and when such a crash occurs. The first casualty is the propeller. Look for propellers you can easily replace. Moreover, since it can crash many times, it is good if you opt for those that are affordable. If they are meant for beginners, manufacturers always have extra ones. Consider these features when you are making a choice. If you have drones with spare parts in the box on arrival, it will be a better choice. The importance of the battery cannot be over emphasized. There are different kinds of batteries. Look for those whose batteries are not expensive. As a learner, you need a strong battery that can last for at least thirty minutes to one hour and thereabout. If you choose a battery that does not last, it could make your learning to be sluggish. You need a battery that can serve for a time to enable you to practice. Usually, there are packs of batteries. You can use six packs of batteries. If you have such a number, it makes things relatively easier as you can just unpack, plug, and begin to fly. Motors is another thing to consider when you are making a choice. Consider the weight of the drones. Generally, you should start with a lightweight drone as said earlier. With certain weight, you require the approval of the FAA before you can use that. As a beginner, something lighter is the best choice. You should know that the motor contributes to weight. Look for the lightweight motor so that the weight does not weigh down the drones. You should know that such motors can destroy easily and you can repair or purchase a new one. The most important thing is to get a product that can last for a long time. These are the most important factors to consider when you are looking for this kind of drone. As a new user, it is better than you get a drone you can use without difficulties. When you consider all these points, there is no doubt that you are going to make a good purchasing decision. My personal top recommendation is for the DBPOWER MJX X400W FPV Drone, for its live coverage, 3D-VR, remote and smartphone control features. Moreover, the price tag is not too expensive. The Holy Stone GPS FPV RC Drone is for the aspiring professionals who wish to make it big in the videography and want to start as beginners. Wow I never thought there are such a wonderful drones available for low prices like shown in this article. I record aerial videos while bouldering or camping outdoor. The aerial videos always produce a new angle of video when you shoot yourself or others. I am thinking about “Holy Stone GPS FPV RC Drone – Wide Angle Live Streaming Wi-Fi Camera’ for my next trip. I hope that will be a good addition to my gadgets backpack.